Teposcolula like its neighbor Yanhuitlán in the Mixteca alta has two attractions, San Pedro y San Pablo, the Dominican convent founded in 1538 and temple built in the sixteenth century, and a Mixteca archeological site. 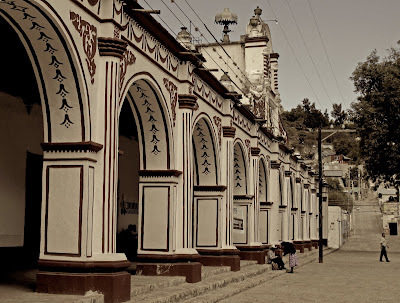 Teposcolula and Yanhuitlán can be visited from Oaxaca in one full day. The Mixteca archeological site, "Casa de la Cacica," is a walled compound and palace, or tecpan, built to house the local native nobility and serve as an administrative center.This unique complex was built during the 1560s contemporary with the main period of convent construction. It was later abandoned, possibly following the plague of 1576. Currently in the final phase of restoration and reconstruction all the structures display plain but well laid stonework. The main building, or "palace," is the most elaborate, fitted with shaped stone openings and banded at roof level by ornamental disk friezes.The friezes feature "floral" medallions carved in light colored stone and set in a matrix of dark basalt with red borders. The alternating circular and petalled disks are thought to signify royal authority and further may refer to the hallucinogenic plants datura and morning glory. The petalled disk also recalls the pre hispanic 4ollín glyph, or Fifth Sun of Aztec cosmology. 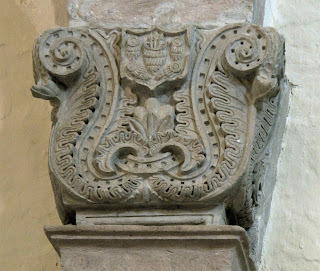 Similar motifs can be seen adorning the church front at neighboring Yolomecatl, just west of Teposcolula. The archeological work is the first project in Oaxaca to focus specifically on a major Prehispanic city and its dramatic transformation during the first decades of the colonial period. 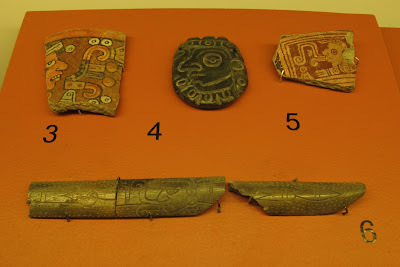 Associated with this site is a museum that contains some of the artifacts uncovered there. Friar Francisco Marin was assigned to Teposcolula in 1541, after being a vicar for two years in Yanhuitlan. 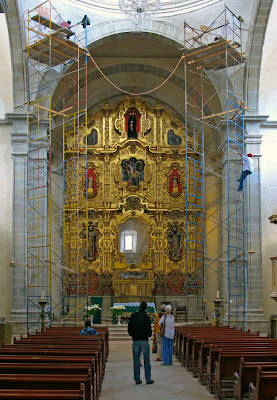 The construction of San Pedro y San Pablo is attributed to him. Andres de la Concha and Simon Pereyns famous sixteenth century painters participated in the interior decoration. They designed portals and oil paintings, according to information contained in contracts signed between 1580 and 1583. The complex includes an open chapel, temple, and the convent house or cloister. The open chapel,also called the Indigenous Chapel, the pride and joy of Teposcolula, is remarkable for the design of its spaces. 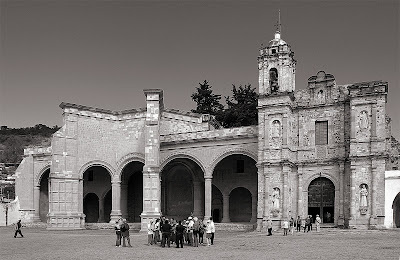 It was built for the evangelization of Mixtecos, who were to occupy the atrium in large numbers. Carvings reflect Tequitqui art. A term proposed by José Moreno Villa in his text The Mexican in the arts (1949), and refers to art made ​​by indigenous peoples of Mesoamerica after the conquest of Mexico. This intermixing of art and beliefs makes Mexican religious art unique and interesting and sheds some light on the culture of Mexico today. "Es el producto mestizo que aparece en América al interpretar los indígenas las imágenes de una religión importada (...) está sujeto a la superstición indígena. Es una extraña mezcla de estilos pertenecientes a tres épocas: románica, gótica y renacimiento. Es anacrónico, parece haber nacido fuera de tiempo, debido a que el indio adoctrinado por los frailes o los maestros venidos de Europa, recibía como modelos estampas, dibujos, marfiles, ricas telas bordadas, breviarios, cruces, y mil objetos menores. No todos ellos obedecían a un mismo estilo y a una misma época"
“Blood is the product that appears on American Indians in interpreting the images of a religion imported (...) is subject to Indian superstition. 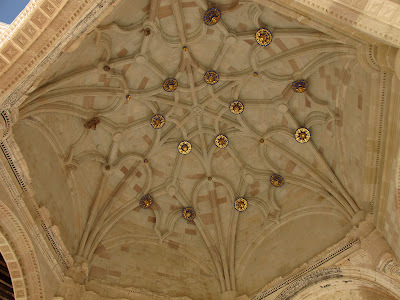 It is a strange mix of styles from three periods: Romanesque, Gothic and Renaissance. It is anachronistic seems to have been born out of time, because the Indian indoctrinated by the monks or teachers from Europe, as models received prints, drawings, ivory, rich embroidered fabrics, briefs, crosses, and a thousand smaller objects. Not all of them obeyed to the same style and the same time "